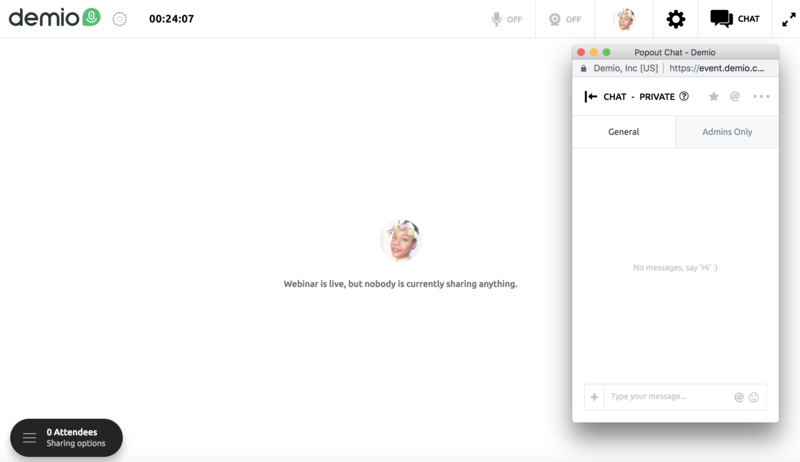 Looking for an easier way to keep the Demio Chat open while running a webinar? Demio now allows Webinar Coordinators to open their Chat box into a new separate Chat window. Chat works 100% the same, but will be in a resizable window that you can maximize or minimize next to any other tab or presentation. Click on the 3 dots for the dropdown menu to appear. After that, click "Popout Chat"
2. After clicking a smaller, separate window with all chats in that tab will appear. 3. You can now resize the window as needed, and use chat normally!